Get top combined WiFi speeds of up to 1.9Gbps with AC1900 in this 2-in-1 CableLabs DOCSIS 3.0 Cable Modem and WiFi Router. Ensure uninterrupted HD video streaming with industry's first 24x8 channel bonding giving you the fastest download speeds, up to 960Mbps even during peak hours. Save up to $120 a year* by eliminating Internet service provider rental fees. Ideal for fastest Internet cable services like XFINITY from Comcast Blast/Extreme and Spectrum data plans. During rush hour, traffic on a highway can become slow and congested; it's the same for the Internet. Cable Internet providers use data channels to deliver the Internet to your home. These channels, like lanes on a highway, get congested during peak hours and your Internet access can slow down. However, having more channels on your modem router is like adding lanes to the highway. The more channels you have the faster you go. The Nighthawk WiFi Cable Modem Router supports industry-leading 24 downstream channels. So relax and enjoy super-fast and reliable Internet speeds even during peak hours. If you want to enjoy the top speed tiers from your cable provider, you're going to need modem router that's approved by your provider to handle large volumes of data. 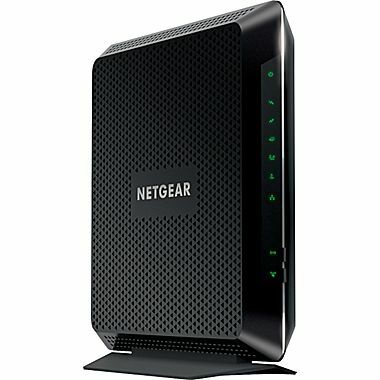 Ideal for the fastest Internet cable services like Comcast XFINITY Blast/Extreme and Spectrum Maxx data plans, Nightawk AC1900 WiFi Cable Modem Router is approved and delivers best-in-class performance with up to 1.9Gbps, first-ever 24x8 channel bonding, and powerful 1.6GHz combined processor. Get blazing fast Internet with while saving up to $120 a year on rental fees with this 2-in-1 cable modem and router. Nighthawk AC1900 WiFi Cable Modem Router is packed with technologies and features so you can game and stream without fear of lost connections or slow-down. Nighthawk features 1.6GHz combined processor, 4 Gigabit Ethernet LAN ports and USB port. And with first-ever 24x8 channel bonding, you'll maintain your connection speed even during peak hours, and technologies like Beamforming+ improves range and reliablity so you can roam freely and keep stay connected. ReadySHARE USB opens up a powerful set of convenient features like USB storage access and streaming media. Connect a USB storage device to the USB port and enjoy high-speed access via WiFi. With ReadySHARE USB you can play, view, listen to, and share your videos, photos, and music on connected TVs, game consoles, or media players. What could you do with more speed? More power? With a 1.6GHz combined processor, the Nighthawk C7000 delivers faster WiFi speed, faster wired speed, faster USB access speed, and faster WAN-to-LAN speeds meaning faster overall network speeds than ever before. So go ahead and put this network to the test in your home. Access and share your media withReadySHARE USB. Simply plug an external storage device into the USB port and you can see your photos and videos, or listen to your music on connected TVs, game consoles, or media players. Is your cable ISP charging you every month just to use their modem? Reduce your bill and bring-your-own-modem. With Nighthawk AC1900 WiFi Cable Modem Router, you'll see improved performance and can save up to $120 a year. Get more the ultimate in WiFi for your home network. Enjoy a blazing-fast, lag-free WiFi experience - up to 1.9Gbps. Homes come in all shapes and sizes and the Nighthawk AC1900 WiFi Cable Modem Router proivdes WiFi coverage no matter where you connect in your home. There's nothing more frustrating than lost connections. With the Nighthawk Cable Modem Router advanced features and best-in-class WiFi technology, you'll reduce interference and enjoy more reliable connections. Sharing across your network is fun & easy, anything from accessing stored data, media, photos & music to wireless printing. Start enjoying your new Nighthawk Modem Roter faster than ever. NETGEAR makes sure installation and management is simple and easy, so you can connect quickly and stay that way. Maintain high security across your network to help ensure your privacy & family is safe while online. Whether it's preventing phishing or just limiting access for kids & guests, NETGEAR has you covered. † Maximum wireless signal rate derived from IEEE standard 802.11 specifications. Actual data throughput and wireless coverage will vary. Network conditions and environmental factors, including volume of network traffic, interference, and building construction may lower actual data throughput and wireless coverage. NETGEAR makes no express or implied representations or warranties about this product's compatibility with any future standards. 802.11ac 1900 Mbps is approximately 3x faster than 802.11n 450 Mbps. Up to 1900 Mbps wireless speeds achieved when connecting to other 802.11ac 1900 Mbps devices. ‡ Maximum rate is derived from DOCSIS 3.0 specifications and actual throughput will vary depending on your Internet subscription with your provider. NETGEAR makes no express or implied representations or warranties about this product's compatibility with any future standards. 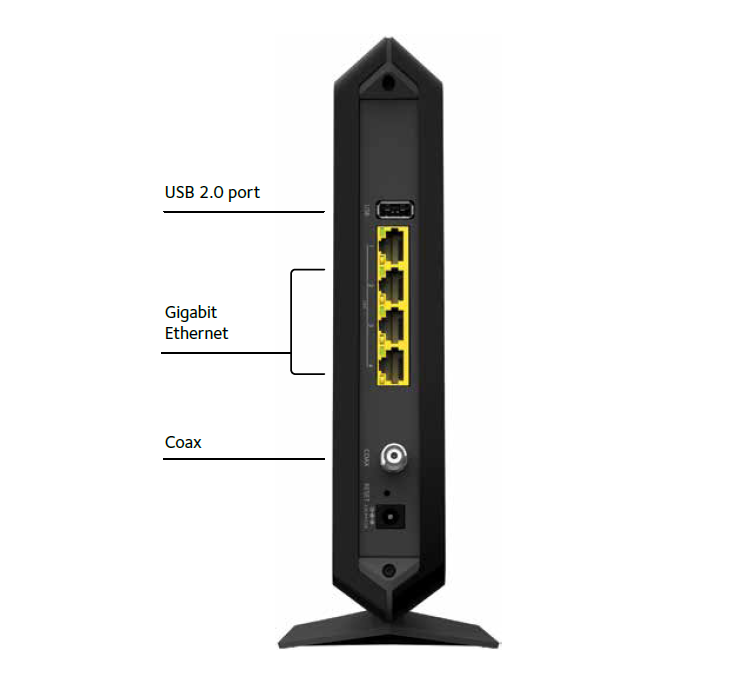 Download the NETGEAR C7000 Datasheet (PDF).